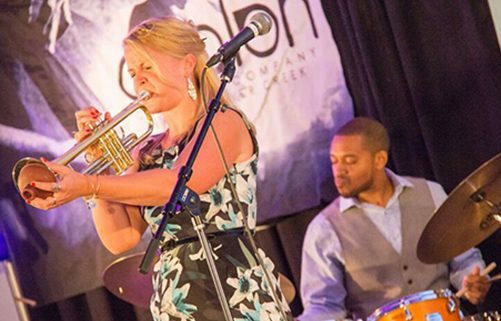 The New York City-based trumpeter and vocalist brings her dynamic sound for double nights at Vail Jazz. It happened. Bria Skonberg is officially big time. The Canadian-born trumpeter and vocalist who has hit the jazz world like a supernova over the last few years was signed by Sony Music earlier this summer. Raise your hand if you’re surprised. The 32-year-old New York City resident blew the doors off during her Vail debut last year and is back by popular demand, performing an intimate show at the Vail Jazz Club Series July 20 and then taking the stage at Lionshead July 21 for Vail Jazz @ Vail Square. Growing up in a farming community about an hour east of Vancouver, B.C., Skonberg dabbled on the piano, bass and clarinet before settling on the trumpet. She began singing in high school and by the time she graduated, was the star of the school band and choir, captain of the basketball team, president of student council and manager of several of her own bands, including a jazz ensemble, big band and marching band. Skonberg has been working full-time as a professional musician for 10 years and moved to New York City in 2010. She has released three studio albums and performs regularly around Manhattan with Wycliffe Gordon and a slew of other jazz greats in between traveling the world with her own quintet. Rooted in traditional jazz but featuring world percussion and alluring melodies, her fourthcoming studio record was crowd funded last year. Oh, but how the framework has changed since then. After overwhelmingly meeting the crowd funding goal, producing the record and bringing it to several labels, the album will be released by Sony’s Portrait Records on Sept. 23, simply entitled, Bria. What can one expect of Skonberg’s musical experience? Let’s say that profound ambiance (and a little hypnosis, in case she’s performing her rendition of The Jungle Book’s “Trust in Me”) is what she’s going for. Always pragmatic, in spite of her big label status, Skonberg is not the type to envision her symphonic debut in front of hundreds of thousands or to dream of yachts and mansions. Skonberg also dedicates a fair share of time on musical education. She’s worked with youth outreach programs through Juilliard and Jazz at Lincoln Center. As co-founder of the New York Hot Jazz Festival, which recently partnered with Central Park’s Summer Stage and is now a major attraction, she hosted a New York Hot Jazz camp for adults this spring. When asked if she could foresee herself still belting out trumpet solos or singing sultry tunes when she reaches the age of 82, she laughs. “I hope I’m retired by 42,” she says. 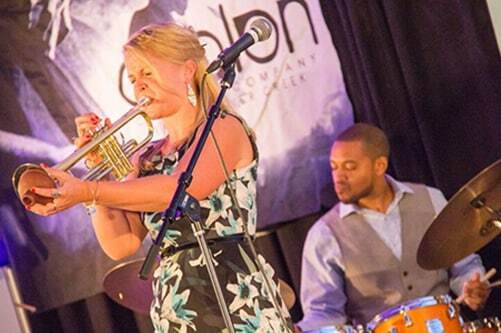 Don’t miss Bria Skonberg on July 20 at the Vail Jazz Club Series at its new location in Mountain Plaza Lounge. Doors open at 8 p.m. and music starts at 9 p.m. Tickets are $40 in advance. Bria’s quintet, including Eric Wheeler on bass, Evan Arntzen on clarinet and saxophone, Ehud Asherie on piano and Jerome Jennings on drums, then takes the big stage for Vail Jazz @ Vail Square from 6 to 8 p.m. on July 21 at the all-weather jazz tent in Lionshead. Tickets are $20 for general admission or $40 for premium seating. For tickets or more information visit vailjazz.org or call 888-VAIL-JAM.